From October 7 to 10, 2000, in Moscow, in the N. Roerich Museum, International Scientific and Practical Conference “New Epoch – New Man” took place, in the framework of which round table meeting “Gifted Children – Who Are They?” was held. More than 300 representatives of regions of Russia, CIS countries, and Great Britain, Germany, Latvia, Lebanon, Lithuania, Italy, the USA, Estonia, Bulgaria, Spain, Sweden, Finland, Slovakia took part in the conference work. 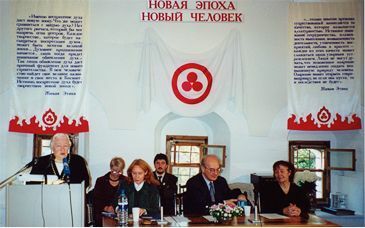 Having connected the passing epoch with the forthcoming epoch with the strong thread of spiritual and cultural tradition, the conference of 2000 was in many respects a unique event. Directly dealing with the subject of evolutionary changes which the planet of Earth is undergoing now, it did not only raise questions of the humanity’s cosmic fate, but also laid new ways for their solution. New World, new Man, new Beauty – these were the signs under which the extremely tight and full of events conference program was carried out, and the round table meeting on the subject “Gifted Children – Who Are They?” became its culmination. “Who are they, representatives of the new stream of evolution?” – this is the question which not only philosophers, historians, psychologists, pedagogues, but children themselves as well, tried to answer. It is the children’s participation in the conference intensive work that rendered to it practical and at the same time especially festive character. Their drawings which formed a wonderful exhibition “The Earth and Cosmos” decorated one of the Museum rooms, and their musical and poetic talents made beautiful evenings which will stay for a long time in the memory of all those who attended them. The following exhibitions were organized in the conference framework: exhibition of group of painters-cosmists “Amaravella”, exhibition of the N. Roerich Museum new acquisitions, exhibition of children’s drawings The Earth and Cosmos”, exhibition of the ICR new publications. The conference received greetings from Special Representative of Russia in the UN S. Lavrov, from the N. Roerich Society in Israel, and from many others. <...> The space of the Russian culture and Spiritual Revolution formulated three most important conceptual methodological theses without which it was not real to settle the practical problem of the New World and New man the way as it was formed in the field of creative revelation. Such an extremely important evolutionary phenomenon as Beauty has its source in Higher Worlds and Higher Creation. Subtle energetics comes to the solid world through beauty, so true art as such is a powerful energetic field in transforming evolutionary processes. Among those who created the Spiritual Revolution, among its poets, philosophers, painters, musicians, there were already those who created a new man, and first of all, in themselves. Having sacrificially passed the earthly way, they left after themselves a priceless heritage, which, unfortunately, has not been appreciated and comprehended according to merit until today. I will not make a mistake if I mention in this row the names of Vladimir Soloviev, Mikalojus Chiurlionis, Alexander Scriabin, Nicholas Roerich and his spouse Helena Roerich. Those are the people on whom the Russian Spiritual Revolution in fact reposed. Vladimir Soloviev, philosopher of genius and poet, embodies that very relationship with the Higher, without which no New Man could be formed, no break through into other reality of a New World could be performed. Mikalojus Chiurlionis, composer and painter, performed in his creative work an upsurge from symbolic Beauty to the New Beauty which we can call real. Alexander Scriabin, composer, philosopher, poet, strived to find real exits into the space of all-human transformation. <...> New pedagogic thinking needs a different measure. It can only realize itself under assumption of a fourth dimension – existence of a spiritual world, spirituality, Higher world, superterrestrical world – a world which exists and to which we all at this or that time go. If it is not possible so far to prove it scientifically, we must at least admit a possibility for such reality existence. <…> It is multi-dimensional pedagogy that dominates in the Living Ethics. Read for instance the “Community”, this wonderful, the best textbook on pedagogy – each thesis in it shows that the human soul broods over the Higher world, higher vocation, higher images. And we, pedagogues, must help revelation of this Higher world in man. We are called to this. <...> During the conference, we talked about the movement of evolution and about development of man in the course of this cosmic evolution. And you already know that the planet of Earth is now living through a very interesting moment – the moment of transition to a new evolutionary turn. This transition causes changes in all related to the evolution processes, in particular, in the process of transformation of man. The process of transformation of man has two trends. One trend is transformation of man in the space of solid earthly matter, the other – evolutionary transfiguration of man in the space of Higher worlds. Maybe, it sounds to you somewhat enigmatically, but we are talking here about two most important evolutionary processes: the man’s birth on the Earth, and man’s passing through various incarnations for many centuries and thousands of years. When these two flows merge – and they have now merged – quite powerful processes start which are related to the change of energetics and appearance of man of a new energetic type. And a whole stream of people of a new energetic type has started now on Earth. If our, previous species of mankind can be called “Man of Sense”, now “Man of Spirit” is coming. These qualitative changes to a considerable extent determine such new man’s characteristics and abilities as well. Speaking about gifted children, we can say that, actually, children’s special ability in itself is not such a great news for earthly conditions. Gifted children have been born throughout the whole history of mankind. But those that are coming now differ in terms of their ability quality from previous, just talented children. In what way? Firstly, they are refined. Secondly, they possess talents which have been rare for centuries – in particular, second sight, second hearing, prophet abilities, and many others. Thirdly, their creative abilities act in a kind of synthesis, making that new quality of creation characteristic of those children. So, I would call it super ability. Possibly, later we shall find a different definition for them. These children appearance sets forth both before the society, before their parents, and before the children themselves a number of extremely difficult problems. They come out as new people form the old environment – this is how evolution develops. It is not possible to destroy all the old first, and then plant the new. They tried to do such things during the social revolution, but evolution does not allow such things. <...> considerable part of our population, and of the planet population as well, among which representatives of the new energetic species of mankind start to appear, is not ready to accept them. And once it is so, a most acute, difficult, and very responsible problem arises – the problem of those children preservation, with all their specific features, because our future is in their hands. The future creative elite is coming. And if we understand this, we must make all possible efforts so that these children be protected from baneful influences. It must be said that a great role is given to the parents in this respect. I would not like – it is my opinion – that the parents start too fast using their children’s abilities, that they send them to competitions abroad, etc. Parents (I do not mean the parents present here) must know that these are refined, very vulnerable people, people of an absolutely different organization. And our usual earthly life adjusted for our species of mankind does not correspond to peculiarities of a different life, peculiarities of new people. We already have examples when super gifted children perished. Nadia Roosheva burned, Nika Turbina broke down, and I can enumerate many more situations. And the negative parents’ role was obvious in those cases. <...> We all understand that gifted, talented children are children especially advanced in their development in a particular sphere – intellectual, or sensual and emotional. The society and state are concerned with the problem of gifted children. Researches are conducted, the nature, sources of abilities, conditions of their development are determined, institutions for gifted children education and training are established, and even individual trajectories of a gifted child development are charted. On the face of it, everything seems all right. But at that, our adult society forgets, probably at an unconscious level, two things. Firstly, we do not want to admit before ourselves that we treat a gifted child like an object. Yes, we show concern for a gifted child, but this is an object of our care, this is an object of our upbringing, this is an object of our education. We totally forget that he is the subject of development, of his own development. And the second thing. <…> a gifted child’s life in his micro-environment and in social medium is difficult in general. It is very hard to pass this “duck-and-swan” way. It is hard for both the gifted child himself, and for his parents, his pedagogues, and our whole community. It is difficult for the child because he is unusual, and unusualness is not forgiven, the people around him would rather see in that gifted child signs of schizophrenia than features of genius. It is hard for him because he is not like other children of his age around him. And those other children’s attitude towards him is, correspondingly, like towards an anomalous phenomenon.